In recent years, the NAMM Show in Anaheim, California, has developed from being mostly an MI show to now also comprise a large and dedicated Pro Audio area in the new North Hall. We will be in this hall on Level 1 with our US distributor, Plus24, throughout the show. And of course you can experience our full product range, including AX32, the MOM hardware Monitor Controller, as well as the new SPQ speaker correction and Dante/AES67 expansion cards. AX32 already comes with support for 64 channels of Dante IP Audio right out of the box, but in an effort to meet demand for an even higher channel count, we now introduce an optional expansion card that adds another 128 channels to your digital audio-routing matrix. The new Dante expansion card also offers sample rate conversion on all channels as well as dual redundancy network ports in order to maximize reliability, reducing the risk of losing valuable production time. 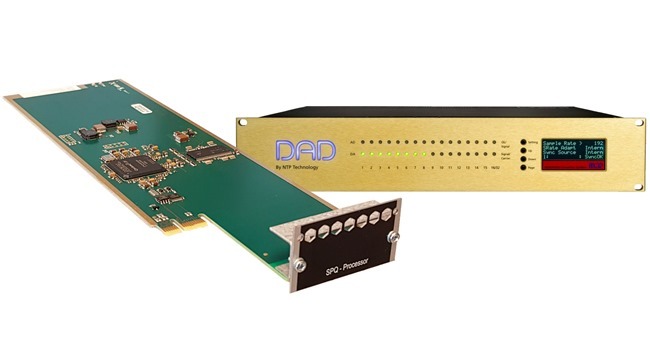 The new Dante expansion card introduces per-card sample rate conversion, which by using more cards allows several independent audio networks that run on individual clocks and sample rates to be connected to and unified in a single AX32 unit. Management of the controls is handled via the DADman control software, where you can configure processing for all output channels in the defined monitor profile - also on cue signals. Processing can be applied for room tuning, bass management and equalizing of cue and monitor signals. And you can easily save and recall all configurations in the DADman monitor profile.